I've been testing the Huawei Mate 10 Pro for a week now. While performance, battery life and software have been further improved, the camera in particular makes a big leap forward. Read more about this in our full review of the Mate 10 Pro. The Mate 10 Pro was launched in the UK and Australia in mid-November 2017 for €799 (about £710), and a Porsche Design version in the UK for €1395 (about £1240). Preorders began as of today (February 4) in the US, and will be fully released on February 18. Available through Amazon, Best Buy, B&H and Newegg, the unlocked version of the smartphone costs $799.99 and comes with a $150 gift card for a limited time. It's important to note that it will not work with Verizon, Sprint and US Cellular, but it is compatible with GSM/LTE carriers (T-Mobile, AT&T, Cricket, etc.). You won't need to wait around for any software updates, as it will run with Android Oreo already installed. The phone comes in three colors—‘Mocha Brown’, ‘Titanium Gray’ and ‘Midnight Blue’. The pink variant will only be available in China for the time being. Judging from the past though, it would not be surprising if Huawei releases a further color in time for the holiday season. There are no variants as far as memory—every Mate 10 Pro comes with 6 GB of RAM and 128 GB storage. There are different SIM versions though. Service provider-locked editions are expected to have only one SIM slot, while unlocked editions will have two SIM slots. If the dual SIM feature is paramount for you, you’ll have to ask your provider which version they have when the Mate 10 Pro is available. The dual SIM model is one of the few that can use LTE on both cards in parallel—useful in times of VoLTE and All-IP. Huawei has overhauled the Mate design with the Mate 10 Pro. Even last year’s Mate 9 Porsche Edition pales in comparison. But this fantastic design may come at the expense of the device’s durability. Huawei jumped on the designed-to-break trend using a glaze on the Mate 10 Pro’s front and rear. Only the aluminum frame holds the device together in a reasonably stable manner. The headphone jack is also the latest victim of the new high-gloss finish. After all, the device had to feature IP67 certified protection against dust and water. The aluminium frame is polished to a high gloss finish and merges seamlessly into the two glass surfaces. The transparent silicone bumper, which is supplied free of charge, and the standard protective film for the display keep the first signs of use temporarily away from the Mate 10 Pro. After a week, the tested Mate 10 Pro still looked like new; apart from small bruises in the protective equipment. But we will have another look at this in a year's time. At the hands-on presentation we had already been told that the antennas for LTE Cat. 18 would be present in the aluminum design as it would have been possible with the predecessor. It could be true, since Huawei has decided not to use the GB-fast LTE in the Mate 10 non-Pro, but offers the tried and tested rugged aluminium design. Unlike the Mate 9 Pro, the Pro version of the Mate 10 dispenses with the dual-edge design and serves the fans of conventional flat displays. Curved Glass is only located on the back and ensures that the device feels leaner in the grip than it actually is. In the back, a "Signature Stripe" decorates the main camera area and provides the new identification mark of the Mate series. The display edges above and below the display shrink to a few millimeters. The new 2:1 format (as always marketed as "18:9") gives us a 6-inch display in a body that would have been able to accommodate only a 5.5-inch display in previous models. Indeed, the compact feel makes a good impression. Just like with the Mate 9 Pro / Porsche Design, the Mate 10 Pro features an AMOLED display. Together with a night mode, smart automatic brightness control and a dark user interface design, Huawei emphasizes the enhanced contrast of the technology. It resolves to just under 403 ppi, has the new 2:1 format and relies heavily on Android's integrated split-screen system to take advantage of the new widescreen format. After the first week the colors are always rich, the contrasts are rich and there are no problems with AMOLED like a burn-in effect. The Mate 10 debuts Huawei’s Oreo-based EMUI 8.0. This new version replaces the Nougat-based EMUI 5, and provides drastic artificial intelligence enhancements in addition to the Oreo core features. The brand-new Neural Processing Unit in the chipset will be automatically accessed by future apps in order to exploit performance advantages in particular. So far, however, there is little evidence of this. The EMUI update from version 5 to 8 suggests a bigger jump than you can actually see. Older devices like the Mate 9 or the Huawei P10/Plus will also receive the update to that version. We have also installed EMUI 8 on our Editorial Mate-8 as part of the beta program. So we'll list only the EMUI-8 features that you'll find exclusively on the Mate 10 Pro. First and foremost, the Mate 10 Pro stands out with the so-called Easy Projection. This feature transforms the Mate 10 Pro into a simple desktop using a standard adapter from Type C to HDMI. Unfortunately, there are still many limits to the current implementation and it still needs to be expanded. However, it already shows great potential for even more complex office tasks. Our test device has received an update within the first week. This fixed a serious problem that caused a massive battery drain in connection with Google Play services. After the update, which could be installed without resetting to factory defaults, the power problem disappeared and the Mate 10 Pro was able to achieve the promised battery life. 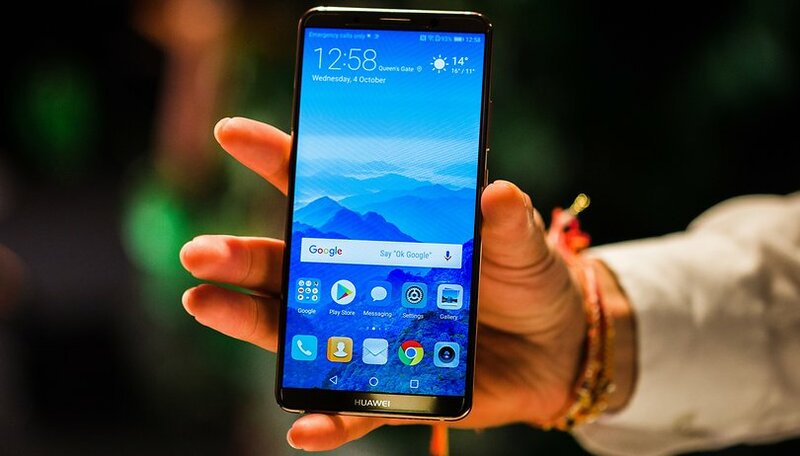 Huawei pursues a hard-working update policy and provides updates for most of its devices on a monthly basis for two years from the date of introduction, and can therefore be classified as reliable and secure. As the hardware star feature, the new Kirin 970 chipset has become more energy-efficient than the previous 960 due to 10nm technology, but the CPU and GPU remain otherwise largely unchanged. The Mate 10 Pro only delivers its performance advantage from the Neural Processing Unit (NPU), which is supposed to be designed specifically for future AR and VR tasks. The NPU was also well advertised in the event. So what exactly is it good for? Currently, that added value is limited to just a few Huawei-specific apps. In the long term, Huawei wants to accelerate third-party apps with the NPU. Together with Microsoft, Huawei has pre-installed a translator app on the Huawei Mate 10 Pro, which translates text modules from one language into another of 40 other languages at unbelievable speeds—and without an internet connection, it still performs at Google level. The NPU’s impressive talents don’t end there. There are some impressive ways it enhances camera use too, which we explore in the section below. The Mate 10’s 128 GB UFS-2.1 memory is fast and plentiful. But a MicroSD slot can still be practical for various reasons. Unfortunately, just like the Mate 9 Pro/Porsche Design and other recent phones, MicroSD is missing in the Huawei Mate 10 Pro. Another NPU application is the normalization of call volume. If you whisper into the phone because you have a cold and your voice is ‘just not very good’, the volume adapts to project the voice at normal volume on the other end of the call. Conversely, if your counterpart answers particularly loudly, his voice will normally reach you loudly but at a slightly moderated level. But, if there is a lot of noise in your surroundings, the Mate 10 Pro lifts the output of the loudspeaker accordingly and makes sure that you understand your caller well. If you speak then into the Mate 10 Pro, your caller won’t hear any of the noise around you thanks to intelligent filtering. Huawei has traditionally been one of the best in the field of speech quality, so we can hardly wait to test this feature out in detail. And then there is yet another quiet farewell to the headphone jack. The Huawei Mate 10 Pro comes with an adapter though. There’s lots of talk about the change in audio tech but if you want my take on this, have a read here later. The audio equipment in the cabinet is just as good as in the Mate 9: A loudspeaker radiates forwards, one downwards. In upright mode, the Duo switches to a two-way mono system. In landscape mode, it becomes a stereo setup. In any case, the output sounds rich and relatively good, which means considerably less tinplate than one would expect from smartphone speakers. On the hardware side, there has been relatively little change compared to the camera setup from the Mate 9. These are now two f/1.6 optics of the Leica Summilux-H brand instead of the f/1.7 with Summarit-H. However, the asymmetric sensor duet remains: The black and white sensor resolves with 20 megapixels; the RGB sensor resolves only 12 megapixels, but has an optical image stabilizer. Each of the sensors has its own image signal processor, whose data merges from the artificial intelligence on the NPU to an image, analyzed in real time and processed in the viewfinder in real-time. In the new Portrait mode, similar to the 2017 variants of the iPhone or Google Pixel, the AI recognizes the scene in real time and adjusts both exposure and post-processing accordingly: Exposure time, focus and saturation ensure that photos get an effective look even without manual post-processing. Green grass just gets a little greener. For this purpose, the NPU uses offline training data that Huawei had evaluated on its home servers from 100 million photos. The camera understands whether you are photographing a pet, a person, plants or food and applies filters that are commonly used for photography of such objects. And especially for fast-moving objects, it is helpful that the focus of that movement follows consistently until you trigger. Especially the Bokeh effect, which was implemented with great effort in the Mate 9, is now used more sparingly, intelligently and accurately. Portrait mode comes with the EMUI-8 update to the other Huawei smartphones. After I was a little skeptical at the beginning about whether so much post-processing will benefit the photos, the results were a pleasant surprise most of the time. The Mate-10-Pro camera or its AI reliably detects what to focus on and colors, sharpens and revs up the dynamics where necessary. The results are always visibly retouched, but still cool. Of course, you can also deactivate postprocessing. Even then, the camera achieves excellent results. This is due to the optical image stabilizer and last but not least to the new, large f/1.6 aperture, which together allow for smaller ISO values or shorter exposures, i. e. more sharpness. Finally, you can activate the manual mode already introduced in Huawei P9 by dragging the bar above the trigger button. There you manually adjust ISO, shutter speed, exposure compensation, focus, white balance or color temperature if you don't like the automatic settings. Selfies are made with the f/2.0 fixed focus snapshot. Here, too, a focus effect is possible, which, unlike in older versions, also recognizes groups cleverly. Blurred faces are a thing of the past. Here you can also see how the portrait mode captures and sharpens all faces. The 4000mAh battery power of the Huawei Mate 10 Pro is outstanding, as expected from the Mate range. The problems with missing notifications about the battery life from previous Huawei smartphones also seem to be a thing of the past after a week of testing. Instead, Huawei now gives you sophisticated, manual control over apps that run in the background. EMUI will not stop them without your permission. Particularly smart is the dark mode to save energy with the AMOLED display of the Mate 10 Pro. The 4,000 mAh battery can be charged quickly with Huawei's proprietary technology lightning-fast; after 30 minutes the original accessory charges from 0 to 58 percent. However, wireless charging is not available and the battery cannot be easily replaced. Starting from 100 percent, I was able to use the Mate 10 Pro for a complete weekend from Friday evening to Monday morning. On another weekend I used it as a Wi-Fi hotspot and took some photos. Then the battery lasted only one day, but in this heavy user scenario it lasted longer than many competitors. Despite its promising performance, impeccable design and top-of-the-range camera, Huawei still stands out in terms of price. The fact that it follows the trend towards more fragility in terms of design and removes the jack plug connection is unfortunately normal and sometimes necessary in view of the competition. Huawei wants to be first in the race for the best smartphone and the pro version of the Mate series is its strongest effort yet. An astonishing amount of hardware from the previous year is hidden inside. Huawei bets on his breakthrough with the new NPU, the little brain behind the Mate 10 Pro and the new camera effects. And with the latter Huawei really knows how to impress. After a week I don't want to let go of this camera for a moment. There's hardly any other phone with which I can get such a good result so quickly. Here, Huawei can stand up to the consistently more expensive competition. In the weeks to come, we'll have the Huawei Mate 10 Pro head-to-head, then we'll find out how its battery life and the results of its camera with or without filters will cut off against the iPhone 8, Pixel 2 or Galaxy Note 8. What do you think? Could the Mate 10 Pro be your smartphone of the year? The evolution of Huawei phones is spectacular, especially on the photo. Just picked up a Mate 10 Pro after 2 years with a Samsung S6 Edge. No way I was having another Samsung with the amount of bloatware that comes preinstalled. I have to say I'm very impressed with the Huawei. No facebook, no twitter, no instagram or indeed any other social media software. What a refreshing idea to allow to only have the one(s) you use installed (or in my case none at all). As noted in the article the camera is superb. I have for years done wedding photography with a Nikon D3 and whilst in ultimate quality terms the D3 is under no threat the Mate 10 Pro gives good enough results that the D3 will rarely see the light of day for anything unpaid. Even hand held night photos come out clean and crisp and with minimal noise. It really is astonishingly good for a smartphone camera! and has a neat little touch in that it can be used as a power bank for other devices! IP67 isn't class leading (there are some IP68 phones) but its good enough for my purposes. I'm very impressed with this phone I must say. Now *that's* a phone. I loved the Mate 9 but knew that I could not manage a phone which was nothing-proof (dust, water, air, sand, sun etc. )-I drop everything. This H.Mate 10 Pro is one of the most beautiful phones I've ever not been able to afford, and seems to have everything I'd want in a phablet. However, my heart skips a beat every time I read about the V30 , a really nice piece of equipment. I didn't want an iAnything and the Samsungs just weren't right for me. I bought the G6 in June and it's ok. It's my first Smartphone, I suppose it's a good $550 "starter" phone (I realize the price dropped 6 minutes after I purchased it). I was worn out from research and experimenting w/every Flagship phone produced between 2016-2017 and had to make a decision and couldn't wait for U11 to stop the dress rehearsals & make it's first appearance in the unlocked USA market. The Note 8 is a nice phone (finally). Huawei gets major points on design with the Mate 10 Pro, but I feel they really missed the mark with such a low resolution at this price point. Western consumers are used to high resolution screens and this just won't cut it. They didn't do themselves any favors by cutting out the headphone jack either. Just a few changes and this phone could have gone toe to toe with the Note 8 and the V30, but it won't now. This article feels like a bad translation and I couldn't follow it in detail, but for sure there's at least one big error - the GPU in the Mate 10 (all variants) is a brand new, 12-core Mali 72. Huawei said it's 20% with a 50% power consumption reduction compared to the one used in the Mate 9.